This review should have been posted from an ER or a weight loss clinic. Baby's Badass Burgers was the second food truck burger sampled/reviewed in two days, and Fat Bruce Lee and I could just barely stand the numbness in our left arms after finishing a second round of 1/2 pound, food truck monsters. Baby's Badass Burgers had recently received a top-ten rating from LAist.com as one of the best burgers in Los Angeles. It was up to us to find out if these burgers were worthy of such high marks. We ordered a couple of All American Girl burgers--plain (1/2 pound for $9) and fries ($2). After a 10 minute wait, our burgers were ready. The hook of the Baby's Badass Burgers truck was super hot girls serving up burgers....sort of a classed-up, rolling Hooters with heels in lieu of white sneakers. This was not really the case in practice, and the male staff equaled the female staff in number. Fortunately, we were not there to rate their appearance...only the food. The Beef: They used an 80:20 Chuck. This satisfying Chuck was beefy, juicy, and only a little greasy. We noted no pesky connective tissue, and the beef tasted mildly of aging. The Seasoning: Baby's Badass Burgers dusted the patties with a savory/peppery blend, which lingered on the palate just long enough to be noticed but not strongly enough to draw focus from the flavorful beef. The Sear: Kaboom! They applied a crunchy, dark, even, and delicious sear to the burgers. The crunch of the sear perfectly complemented the crunch from the toasted bun to provide a nice range of textures. The sear brought out the beefiness and savory flavors of these cheeseburgers. 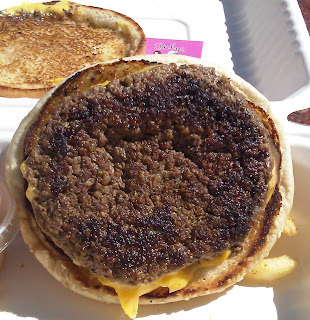 The Preparation: They had the Chuck ground to medium coarse, and the thick, 8 ounce patties were gently formed. The burgers were firm enough to provide substance, but they were not chewy. The burgers were griddled to a juicy Med/Med-Well on a very hot griddle. 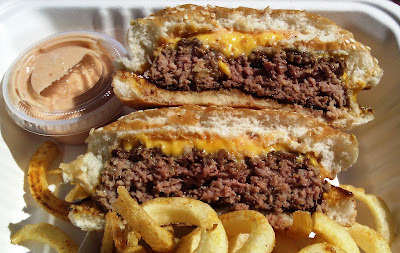 The Cheese: Baby's Badass Burgers melted a thick slice of American cheese on our burgers. The cheese was perfectly gooey and just salty enough to enhance the flavor of the burgers. 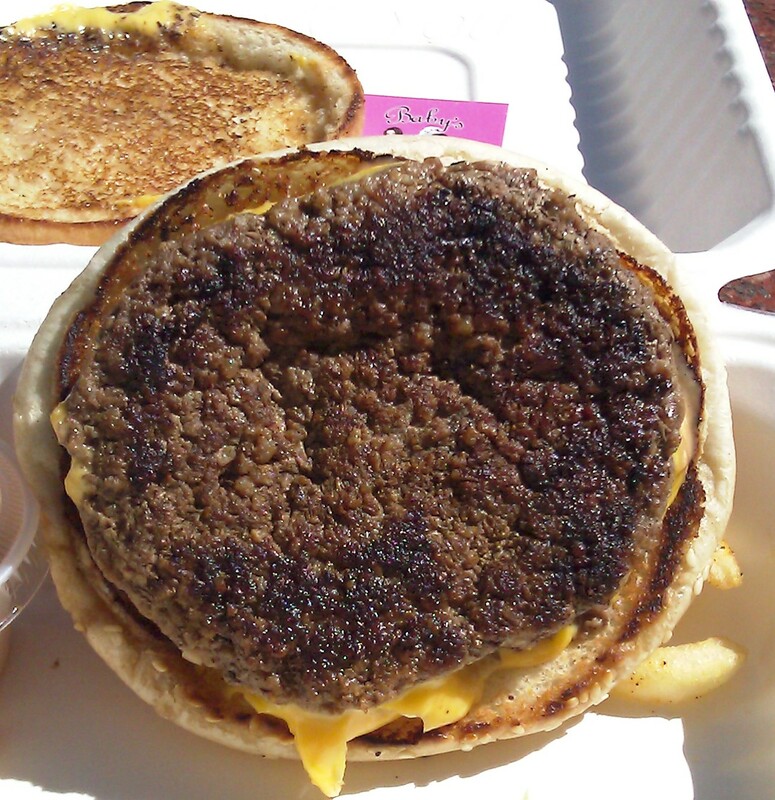 The Bun: This was a crisply toasted, seeded, standard, fresh, moist, burger bun. 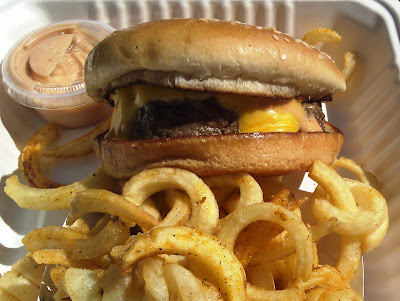 It closely resembled the Sarah Lee buns employed by Five Guys Burgers and Fries. The bun was a winner. The Fries: The curly fries ($2.00) were delicious. They were crisp on the outside and creamy on the inside. They were seasoned with something resembling a Lawry's Seasoning Salt, which was just right. I got the sauce for my burger on the side, and this made a perfect dipping sauce for the fries. The Value: It was $11.50 for a big cheeseburger, fries, and no beverage. The burger was good, but it was just Chuck, so the price was a little on the high side. The value was below average on this burger. Still, it was more than I wanted to eat. I only got through 2/3rds of my burger and half of my fries before I gave in. Fat Bruce Lee polished off his burger and fries and headed over to the ice cream sandwich truck and continued on his culinary journey. Seriously, keep your hands and feet away from his mouth. The ingredients in the cheeseburgers at Baby's Badass Burgers were superior in every way to the cheeseburgers that we ordered from the Grill 'em All truck on the previous day. 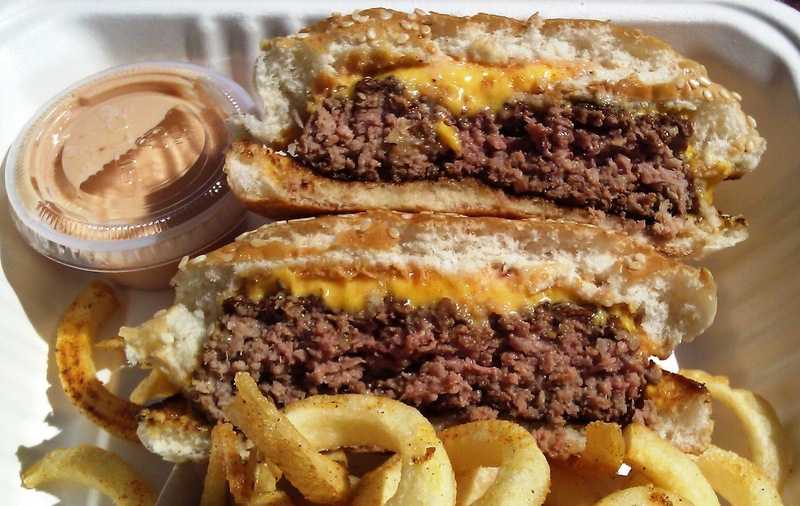 The beef was flavorful; the patties were properly seasoned; the cheese was delicious and gooey; the buns were not overpowering in their sweetness. The level of skill in preparation was equal (superb) in both cases. Baby's Badass Burgers served up darn good cheeseburgers. They were a little pricey for Chuck. Still, if you're hungry, and you're in the neighborhood, we recommend a stop at this food truck over a stop at the Grill 'em All truck. Burger Review : Baby's Badass Burgers skillfully prepared darn good cheeseburgers. These were not Top Ten list burgers by our statndards, but they were very, very tasty. Also, this truck was West-side friendly and listed regular visits to Santa Monica on its website.